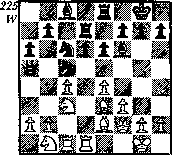 If 26 NxP K-Nl allows Black to exchange off into a very favourable ending. Black now has an easy win - too easy perhaps!? Black has no objection to his 'ugly' QPs - bearing in mind how they got there! White keeps trying . . . 40 . . . QxR? ?41 Q-B7 mate. Why doesn't White resign? Obviously Black isn't going to fall for 42 . . . QxR?? - he's already avoided that. Karpov perhaps felt insulted here: a top-flight grandmaster two pieces up against a mere master who nevertheless continues playing . . . Well he couldn't carry on two pieces and a queen down, so . . . 42 ... P-Q7?? Do see each move is made with care. Black had a simple win with 42 . . . B-N4 (But not 42 .. . Q xP? 43 RxN+ QxR 44 QxB+ and White draws by perpetual) 43 R-R7 P-Q7 44 RxQ P-Q8=Q + 45 K-B2 R-Bl + (45 ... Q-Q7+ is not so clear) 46 Q XR+ (46 K-N3 Q-K8+ 47 K-R3 Q-K6 + ; 46 R-KB7 RxR+ 47 P xR Q-KB8+ 48 K-N3 QxBP and White does resign) 46 ... K x R and wins. But now . 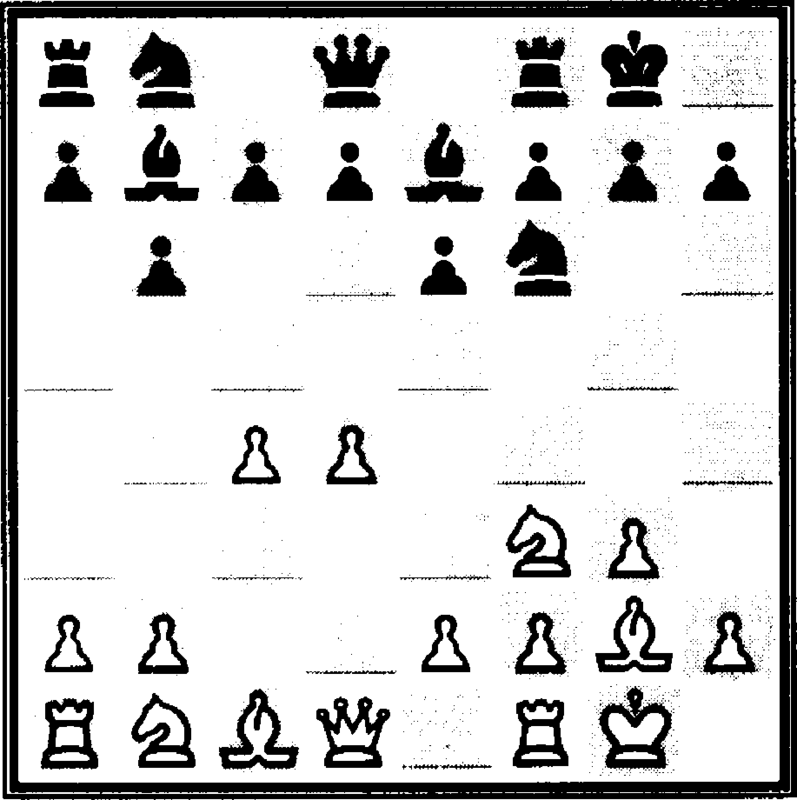 . .
43 ... QxR44 Q xB+ K-Ql 45 Q-Q7 mate and Black's queue of potential queens is of no avail. PR5 v. Lithuanian SSR: X moves. This game, is unfortunately, unavailable - it is the only one of Karpov's games which did not appear in the Russian bulletins of this event. Until the sharp variation, beginning with 4 P-B4 was worked out-the continuation 4 B-KN5 was reckoned to be the most active. There is a straightforward plan: White castles long and inaugurates a K-side pawn storm. Ten to fifteen years ago the automatic reply to 4 B-KN5 was 4 . . . B-N2, but then it was found that it is most important to secure the defence of the d5 square at once, so that after 5 P-K5 PxP 6 PxP QxQ+ 7 RxQ N-N5 one need not fear a sudden attack by the white QN. 5 P-B4 gives better chances. 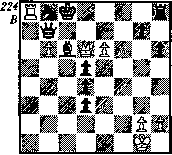 Against the old plan chosen by Karpov there is a perfectly good antidote.